Do you believe you're the kiss of death for any greenery you bring into your Springs luxury apartment home? You don't have to be born with a green thumb. Just follow our tips and hacks for the care and feeding of healthy houseplants. Brightly colored plants need more light than others. When deciding on placement of your plants, remember that south-facing windows get the most light. If you have east- or west-facing windows, take note of how much sun comes in during the morning and afternoon. Give containers a half-turn every couple of days to keep plants growing evenly. Too much sun is just as bad as not enough. You may need to move plants during times of hot weather. Do you tend to overwater plants? Place a circle of ice cubes around the plant, taking care to keep them from touching the stems. As the ice melts, it provides a steady and even source of moisture. Put a damp sponge in the bottom of the pot to keep soil moist. It can also soak up the excess if you accidentally overwater the plant. Worried about coming home from vacation to brown plants? Place a towel in the bottom of your bathtub and fill with two to three inches of water, then arrange the plants on top of the towel. Dirty leaves absorb light less efficiently. Mist plants in the morning with room temperature water to keep them clean. Be careful not to mist plants that are exposed to full sunlight as the water droplets can act as a magnifying glass and burn leaves. If your plants are drying out quickly, chances are it's time to repot. The plants have most likely outgrown their containers and it’s becoming root bound. You're not the only one who gets a pick-me-up from coffee. Recycle used coffee grounds by mixing them with potting soil to add organic nutrients and balance the acidity. Juiced lemon halves make a perfect "pot" to sprout seedlings. Once they start taking root, plant them in a new container, lemon half and all. Brown-tipped leaves are usually an indication of low humidity. 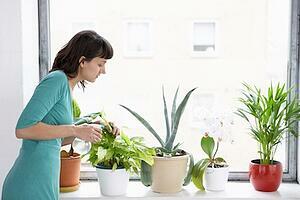 You can use a humidifier, but grouping plants together is an easy (and inexpensive) way to raise the humidity level. Still not feeling confident? Here are some (almost) fool-proof ways to grow indoor plants. Plants without soil? Yes, it's true. Herbs like mint and lavender, green plants like philodendron and ivy, and even flowering plants such as begonias and impatiens are adaptable to growing in water only. Terrariums are well-suited to apartments because they're small and self-contained. Creating a DIY terrarium is a great way to add some unique decorative elements. Have you had success growing houseplants? Share your favorite indoor gardening tips in the comments!